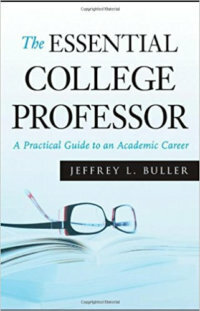 The Essential College Professor: A Practical Guide to an Academic Career. Jeffrey L. Buller. San Francisco: Jossey-Bass, 2010. When one enters academia as a professor, what are the roles, responsibilities, and expectation of that person? How does one make sense and navigate the multiple and sometimes conflicting demands of academia? And how can one succeed without having to reinvent the wheel? The Essential College Professor provides a pathway for new and established academics to become successful in teaching, scholarship, and service. This book is divided into four parts about the college professor – the career, as a teacher, as a scholar, and as a citizen – with each part consisting of advice of how to succeed. The first part, the college professor’s career, begins with chapters about applying for a faculty position and consists of sensible advice such as knowing where to apply, preparing your application material correctly, conducting yourself professionally during an interview, and negotiating your contract. This section also reviews the numbers and types of activities that a professor does, how to put together an academic portfolio for tenure and promotion, and talks about navigating the politics of one’s department. For junior faculty, Buller recommends one to think about what sort of career one wants to have, how to select mentors to achieve that goal, and how one’s career goals guide one’s decisions in service and research. For midcareer faculty, questions of whether to stay at one’s institution or to look elsewhere becomes the preeminent concert; while for senior faculty, the question is whether one wants new challenges (e.g., institutional roles, such as chair), opportunities (e.g., technology, civic engagement), or changes in one’s work-life balance. The second part, the college professor as teacher, examine teaching in a variety of contexts and reviews the best practices for syllabi design, creating course material, student learning, promoting student engagement, and dealing with classroom management issues. For teaching students one-on-one, Buller offers some common sensical advice like never meet the student outside of work, do not share personal information, and do not have the course be dependent upon one single grade (i.e., provide multiple assignments throughout the semester). For small classes, Buller recommends various types of teaching: seminar, Socratic, case study, simulation, and co-teaching; for large classes, he suggests practices like making the instructor less anonymous, encourage discussion outside of class, have students lead certain units or break out into smaller groups, encourage active learning, and design strategies to increase class attendance. For online or hybrid courses, Buller talks about its advantages (it is not geographically-based or time-dependent and makes assessment easier) but fails to discuss some of the challenges of teaching online: the inflexibility of certain software programs, the amount of preparation one needs to teach online, the technical problems that can result from online teaching, and the amount of busywork that online teaching tends to promote as opposed to effective assignments. With respect to classroom management issues, Buller lists the most important ones and again recommends sensible solutions to them. Professors should talk to students if they suffer from grade anxiety and try to persuade them to see the course as an opportunity to learn; forming a connection with students, usually by knowing their name, to promote class participation; document your assignments and grades in the event of a student grade grievance; and treat students with courtesy and professionally. Students who have behavioral problems in the classroom should be categorized as controllable and non-controllable and address accordingly. Critical in dealing with these types of situation is knowing the university’s policies. Buller concludes this section with an appeal for professors to consider the scholarship of teaching and learning as a path to not only improve one’s teaching but also be able to partake in research. The third part, the professor as scholar, looks at the range of opportunities for faculty. For grants, Buller recommends knowing one’s audience, provide a reason why your application is relevant to the foundation, focus on deliverables, and address how one will assess the grant’s success. For books, he suggests cultivating relationships with publishers and follow the guidelines that publishers require in one’s book proposal. Strangely Buller fails to talk about writing for articles, essays, book reviews, peer-reviewing, and engaging in public writing. However, he does discuss Boyer’s Scholarship Reconsidered which looks at scholarship in a multi-faceted manner (e.g., scholarship of service, teaching, application, experience, creativity, etc.). He also talks about the need to establish professional networks for scholarship and how one can balance scholarship with the duties of teaching and service. One of the more interesting chapters in this section is how to overcome the “research block,” which he provides two sub-categories: inspirational block (ideas will not come) and writer’s block (the words will not come). The strategies he proposes to overcome both types of “block” are worth mentioning. To overcome inspirational block, try adopting a different methodology, work in a different place, start the project in a different point (e.g., the middle instead of the beginning), change one’s point of view about the topic, consider the most outrageous idea you can develop, or think of titles instead of ideas. To overcome writer’s block, consider a new routine if you have an established one, write something else than your current project (e.g., a book review instead of a book), and stop writing mid-sentence every day. The fourth part, the professor as citizen, starts by pointing out that faculty are members of multiple communities: departments, colleges, universities, the public, and one’s discipline. Buller offers a novel way for how professor can see themselves by looking at one’s curriculum vitae. By focusing on what one wants to be remembered for, a professor can decide which community he wants to spend his or her most efforts. The rest of the section Buller talks about the various types of roles professor can play in their career – committees, advisors, mentor, and administrative – as well as how to manage conflict with one’s supervisor and colleagues. The typology he presents is a useful one in identifying and resolving conflict in one’s workplace: 1) problems likely to be solved; 2) problems unlikely to be solved but managed; 3) problems unlikely to be solved but isolated; and 4) problems unlikely to be solved, managed, or isolated. The Essential College Professor covers the main roles, responsibilities, and expectations of an academic in American higher education. It is a blueprint for professors to know the “how” and “why” of their profession and should be required for all graduate students who are contemplating a career in academia. It should also be read for those who want to know more about the life of academia. Whether you are part of American higher education, The Essential College Professor provides an accurate and helpful account of what professors do and how they should do it.